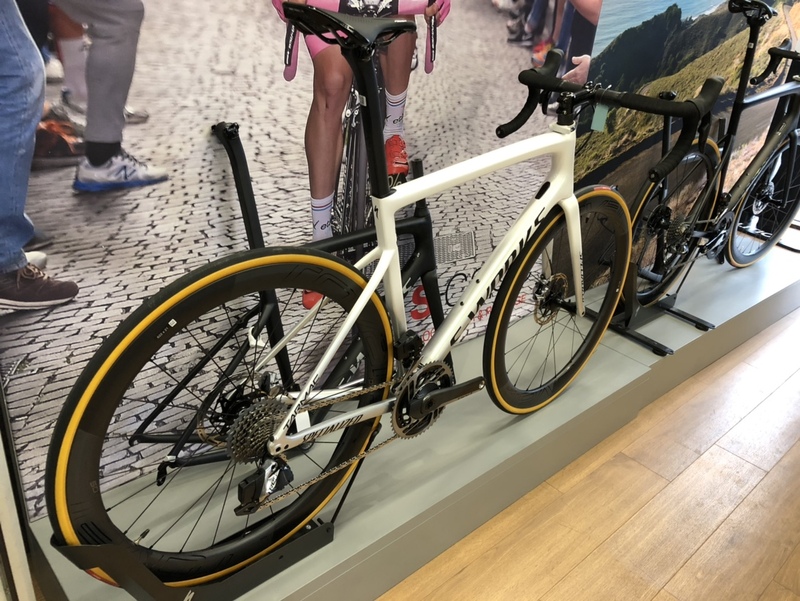 SRAM today unveiled their latest road groupset, RED eTap AXS. The RED eTap AXS groupset features a 12-speed cassette controlled by an improved eTap AXS electronic-wireless control system with motorised shifting on the front and rear derailleurs. The SRAM RED eTap AXS Disc groupset with Quarq power meter chainring set. A rim brake groupset is also available. 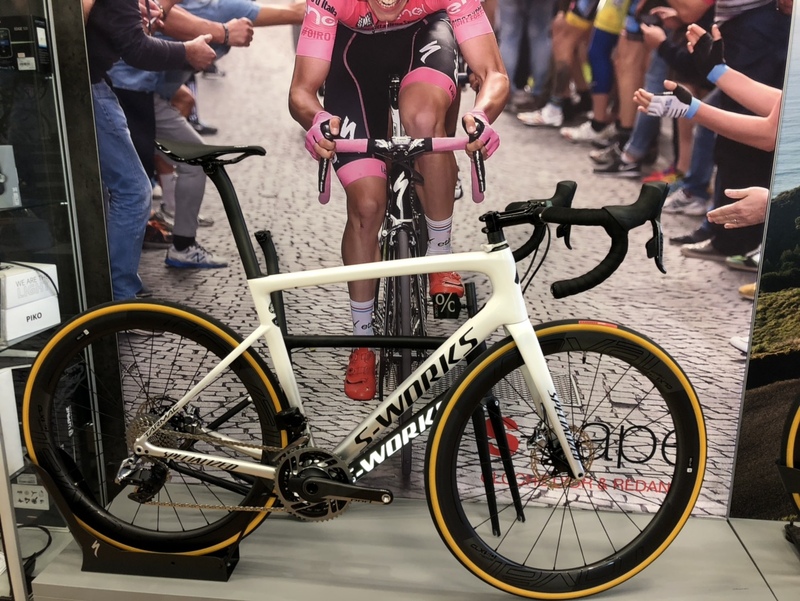 While 12-speed and eTap AXS are both cutting edge developments, it's the new gear that goes against most against road groupset traditions. Traditionally an 11 tooth sprocket was the smallest on road cassettes but the RED 12-speed cassette goes as small as 10 tooth. 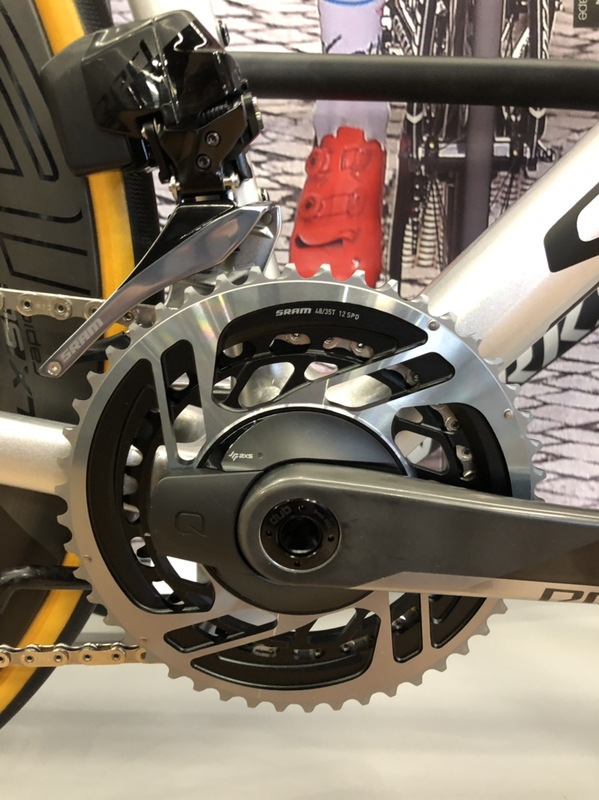 This smaller sprocket allowed SRAM to reduce the size of the chainrings compared to standard 11-speed chainrings, while still offering an extended range at both the top and bottom end of the gearing. The reason for shrinking the chainrings, smoother gear progression when shifting. The 2x RED chainring gearing options now include 50/37, 48/35, and 46/33 which replace the traditional 53/39, 52/36 and 50/34 respectively. The RED single chainring options range from 36 tooth up to 46 tooth, with the aero chainrings topping 48 and 50 tooth. The 12-speed RED cassette is available in three variations, 10-26, 10-28 and 10-33. SRAM explains that it made an effort to reduce the number of steps in any given gear change. The pay-off is a smoother shifting experience with less fluctuation in cadence when up or downshifting. As mentioned, they reduced the size of the RED chainrings to create smaller jumps but they also paid close attention to creating smaller steps on the RED cassettes. The 10-26 and 10-28 cassettes boast 7 single tooth steps (See the chart below). That said, there is a considerably big 5 tooth jump from 28 to 33 on the widest range cassette offered. Granted that this particular gear is designed as a bailout option for gravel riders on steep slopes. SRAM RED ETap AXS new mid range gear ratio is a 48-35 chainring and 10-28 cassette combination. We're going to have to come to grips with the idea of smaller chainring sizes but the pay off is a wider range and smaller jumps in shifting, which SRAM believes will noticeably improve the experience of changing gears. The RED eTap AXS rear derailleur employs an all-new chain retention system to reduce the likelihood of the chain becoming dislodged. Instead of the friction clutch system seen on mountain bike derailleurs (and some road derailleurs), SRAM's new Orbit chain management uses a silicone fluid damper system to reduce chain bounce and derailleur cage movement. 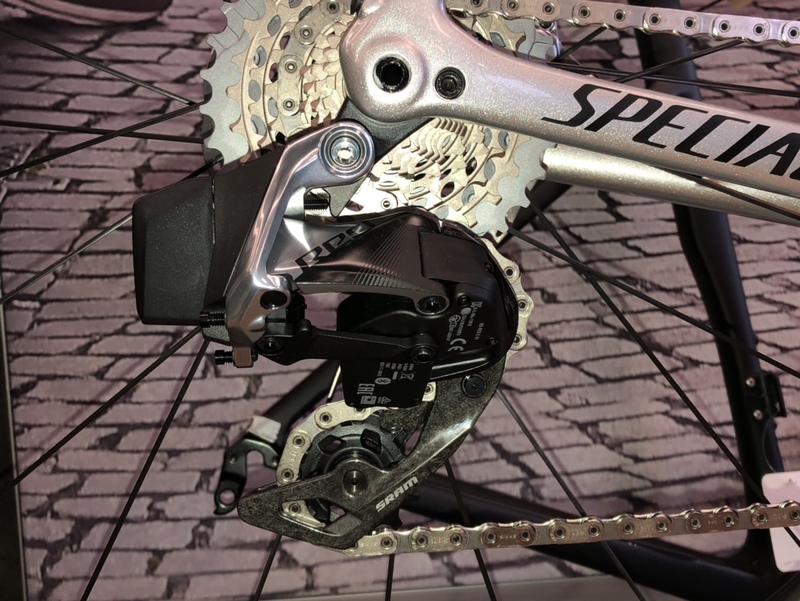 The advantage the Orbit system over the friction clutch is that there is no added resistance on the derailleur under slow or light movements, like shifting gears. While the faster, harsher movements associated with chain bounce are resisted. It is good to learn that the Orbit system will require no servicing. The RED eTap AXS derailleur features a single design with the Orbit system standard across 2x and 1x configurations. This also means that one derailleur design (cage length) is compatible across all gearing combinations. SRAM RED 42T and 48T aero cranksets. 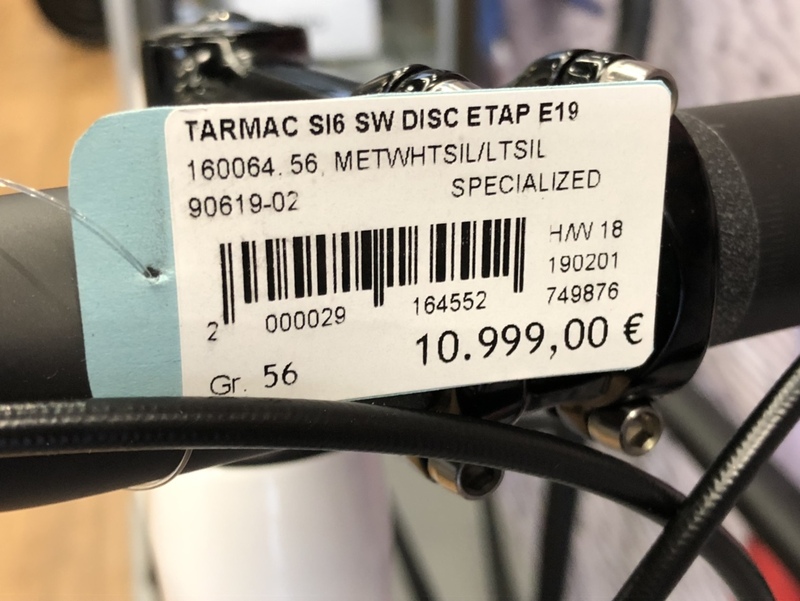 Yes, SRAM is doing a 1x specific RED eTAP AXS groupset. As mentioned above, the single chainring sizes range from 36T to 46T (in even-numbered progression, of course). 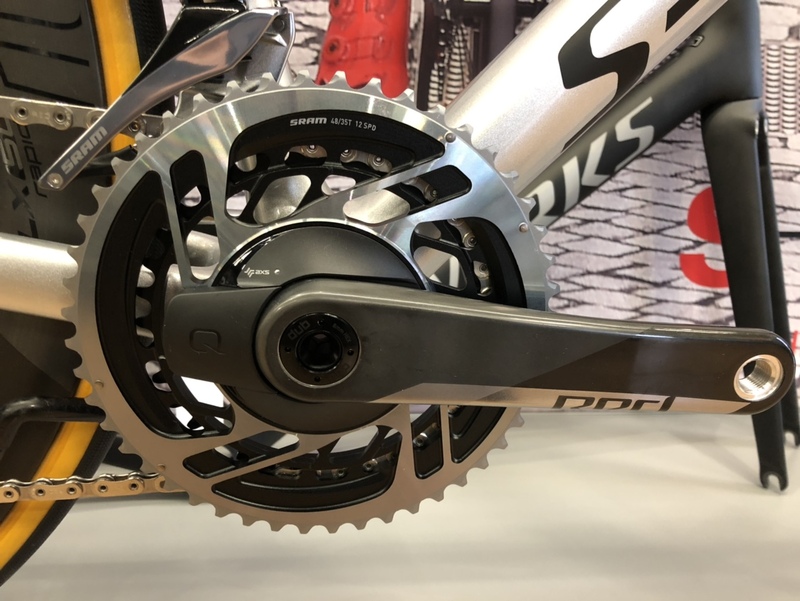 While some riders may employ the single chainring groupset on the road, SRAM is also looking to provide versatility to the ever-expanding needs of cyclists, with those exploring off-road firming in mind. 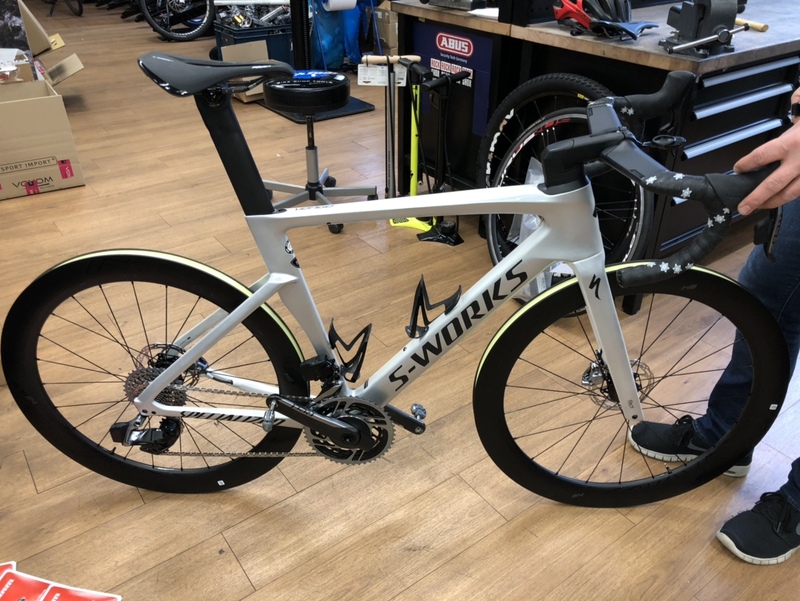 There is also be an aerodynamic package to accommodate time trialists and triathletes which includes the option of a smaller, more easily integrated eTap BlipBox. The disc-like aerodynamic chainrings are available in larger 50T and 48T sizes. The AXS App allows for an even deeper level of personalisation through your smartphone. From the app, you can change the behaviour of the components and controls, get maintenance reminders, update the firmware, see battery status. The App is available on both Android and iOS. Does this groupset introduce any new requirements? The RED crankset is designed to be used with a DUB road bottom bracket. The DUB bottom bracket is compatible with a number of existing bottom bracket standards, including BSA, BB30, PF30, BBRIGHT, PF30A, 386, and PF86.5. This is a move that SRAM has already made on the mountain bike side. The 12-speed RED cassette requires an XDR ("XD Road") driver body to mount to the hub. This is a standard that Zipp has been offering for a number of years but it has not seen much adoption, until now. The XDR interface is designed specifically for road hub applications and is 1.85mm longer than XD driver bodies used for SRAM mountain bike cassettes. XDR drivers are compatible with XD cassettes with the use of a 1.85mm spacer. The XDR driver body is an open standard for any hub manufacturers to apply. 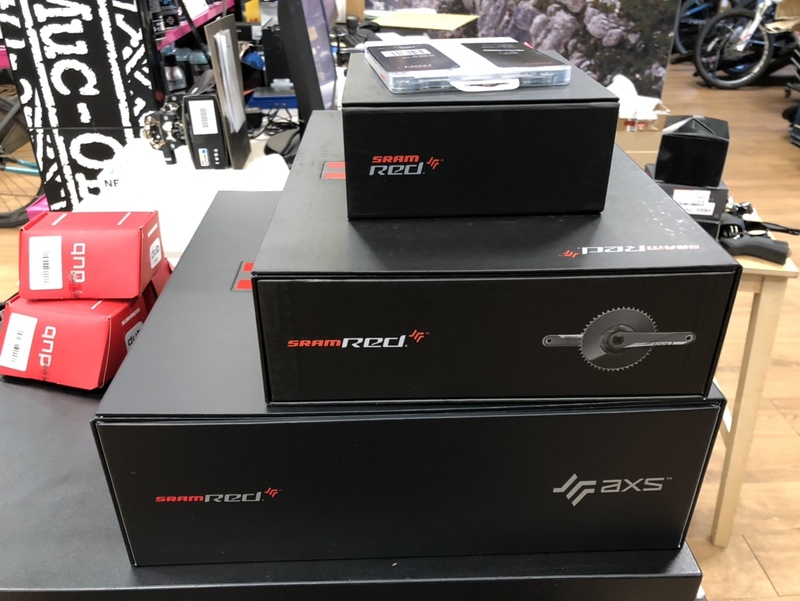 For a bunch more details on SRAM RED eTap AXS, please see the press pack provided by SRAM below. Road bikes are faster and more capable than ever, and riders are expanding what’s possible with drop bar bikes. X-Range offers wider range, more useful and smoother gear progression, as well as smarter shift settings—enabled by AXS. On tarmac or gravel, 1x or 2x, eTap AXS gives a quiet, secure, and smooth ride. Thanks to Orbit chain management and a unique Flattop chain, you’ll ride more confidently and efficiently than ever—no matter the terrain. Control. Personalize. Monitor. AXS—SRAM’s new bike component integration system—takes eTap wireless shifting to the next level. The SRAM AXS app allows riders to see battery status, change component behaviour, personalize controls, get maintenance reminders, and update the firmware. A smaller eTap BlipBox easily integrates into aero frames or the new Zipp Vuka Aero bar, improving aerodynamics and allowing for a super sleek look. By integrating a Quarq DZero power meter into our chainrings, we made power measurement more affordable and accessible—and lighter, too. AXS allows you to mix and match Road and MTB components. 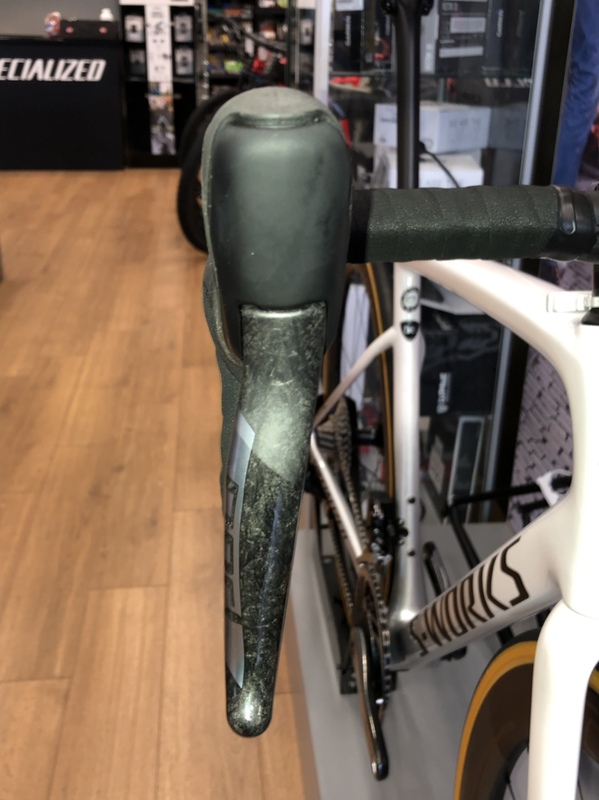 Dropper post with a drop bar groupset? No problem. The heart of the connected cadre. The SRAM RED eTap AXS rear derailleur is AXS enabled for easy personalization and designed for both 1x and 2x systems. Advanced chain management keeps it silent and secure no matter the terrain. The derailleur also comes with faster pulleys, bearings, motors and signals, improving speed in every way. The all-new SRAM RED chain was developed from the ground up. The unique link shape allows the chain to be narrower and lighter while increasing strength and providing more space between the outer plates of the chain and the cogs on either side. Result: a quieter chain with faster, more precise shifts. of gears. It’s specifically designed for wireless electronic shifting and the one-piece design offers you the best in weight savings. Fully wireless electronic shifting. Fully hydraulic disc braking. 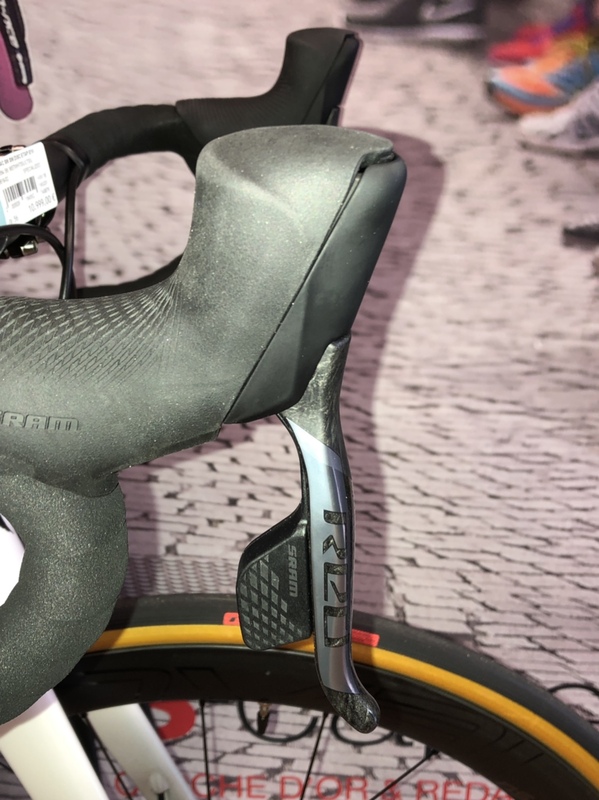 The SRAM RED eTap AXS HRD shift-brake system is the future. And the future is custom. AXS enabled and easily personalized for hand size and reach, this is the best shifting and braking experience—for all riders. Award-winning eTap shift logic, now with the connectivity of AXS. The SRAM RED eTap shift-brake levers build on this foundation while integrating our newest technologies. And it’s easily personalized, from shifting sequences to reach. The SRAM RED AXS power meter breaks with tradition—and breaks through to new levels of performance. We re-engineered road gearing: reducing front chainring size and adding more range to the rear cassette. We also maintained a 13-tooth delta on all chainring pairs, ensuring precise shifting for any setup. This results in more useful gearing and better shifting across all configurations. Our power meters are also designed with Quarq DZero power measurement into crankset. Welcome to the pinnacle of the power meter. In certain disciplines, the single-ring drivetrain reigns supreme. Championing simplicity, strength, and durability, the SRAM RED 1 AXS™ power meter meets the demands of triathletes, time trialists, and cyclocross racers. The power meter features improved aerodynamics thanks to direct mount aero chainrings with fully integrated power, and the tighter gearing range is perfect for racing and areas with flatter terrain. The SRAM RED crankset leverages a pivotal design innovation: smaller chainrings and a wider cassette range. This leads to smoother and faster shifting up front and more useful gearing for today’s riders. The new configurations improve cadence and efficiency while also delivering shifts that are crisp, clean and quick—every time. Triathlon. Time Trial. Cyclocross. Some disciplines are made for 1x. And while our X-Range 2x set up has integrated much of the simplicity of a 1x system, there are still times when a single ring is best. The SRAM RED 1 crankset offers the most demanding racers the right mix of features—aerodynamics, durability, and simplicity. The SRAM RED brakeset improves on all fronts: it’s lighter, more aerodynamic, and leverages more braking power. What’s more, it features broader tire clearance. A classic made modern. 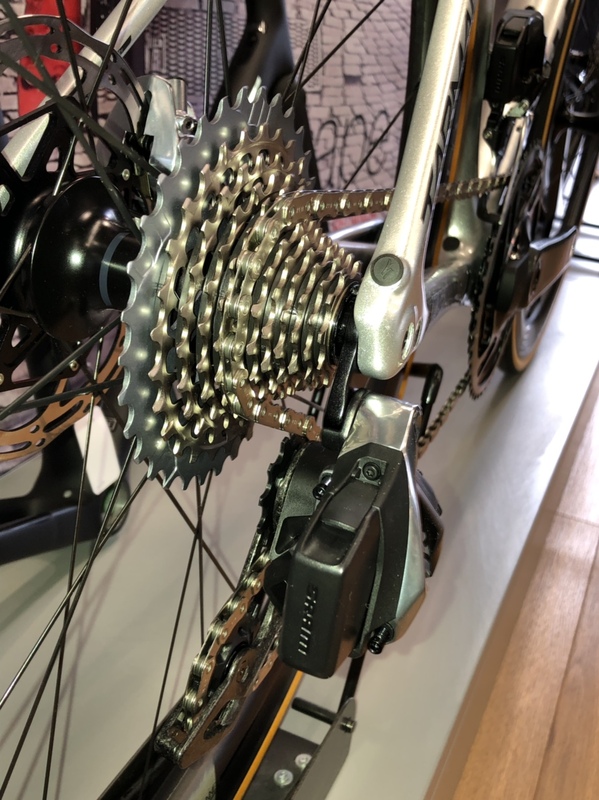 AXS is SRAM’s new bike component integration system that connects electronic bicycle components and software. The SRAM AXS App allows riders to see battery status, change component behaviour, personalize controls, get maintenance reminders, and update firmware. Orbit technology is an innovative new form of derailleur motion control. It utilizes silicone fluid as part of an elegant and ultra-lightweight damper system. Compared to a standard friction clutch system, Orbit technology places no additional resistance on the rear derailleur’s spring when under slow or light movement. This means easier shifting and rear wheel removal. And while riding, the fluid damper reduces chain bounce. It’s rock-solid reliability for both 1x and 2x systems. Quarq’s next-generation DZero power meter platform is named for the DØ Experiment, one of science’s most accurate and innovative projects to detect subatomic particles moving at the speed of light. With a new measurement circuit, a revised strain gauge design, improved accuracy throughout the pedal stroke, and software advances, DZero represent the state of the art in power meter technology. That to me was the only shortcoming of Etap - which Shimano offered on the latest Di2 as Synchro Shifting. Turns your 2x11 into a 1x16, automatically choosing the correct chainring/cog combo to give you the next ratio in an efficient chainline. No need to think about being in the correct chainring, you simply shift up/down and the system does the rest. USD4300 for the disc with power meter. this does look superb though. i love my current Etap. SRAM have just gotten this right! This groupset looks amazing, ticks all the right boxes, including the crazy price tag! For the South African Randela holder, yeah, it'll dent the plastic card oraait. "You can assign the groupset to work in one of two semi-automated ways. Firstly, there’s sequential; when you activate the next available gear it will automatically actuate the front derailleur to keep the ratio change even between shifts, and therefore keep your cadence steady. Secondly, there’s compensating; this smooths out gear shifts, so when you change the front ring up or down, it compensates at the rear derailleur, moving either one or two cogs to keep your gear progression even and your cadence steady." I don't believe this is true based on the following statement in the article :- "Chainrings can be easily changed without requiring recalibration of the power meter". I really hope SRAM haven't been that stupid. It sounds like something Shimano would do! No they are not, they use direct mount chainrings.